If you’re here reading this, then one thing is for sure: you too are sick and tired of sitting all day! 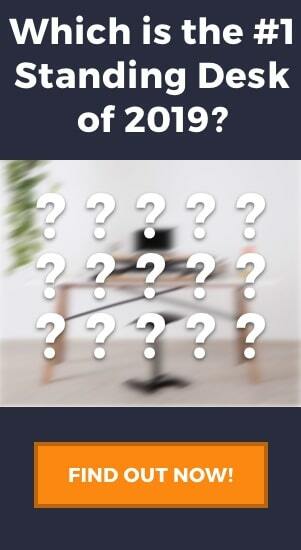 If you don’t want to read through this whole article, and just want to have a look at our favorite standing desks, then we recommend you jump straight to our favorite standing desks of 2019 article, or even check out some of the individual product reviews we have such as the Cooper by Fully, a sit-stand desk converter (if you’re not sure what this is, do not worry we will explain it all soon!). It has become more and more popular in recent times to opt for a standing desk, or even something more active like a treadmill desk for your office or workspace, and for good reason. Sitting down all day can lead to chronic aches and pains, tight and weakened muscles, and poor posture. By just incorporating a standing desk into your work life, you can do a whole lot to alleviate those pains. In this article, we’ll jump straight into the pros and cons of standing desks, and help guide you through the noise to choose the right standing desk for you. Whether you want to best desk available on the market, or a simple standing desk to fit your budget, we’ll cover those steps in this article. 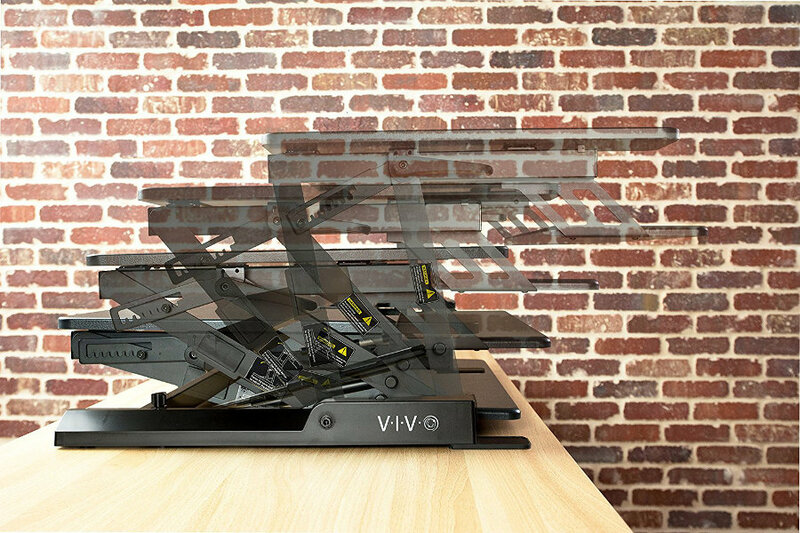 DO NOT MISS: Take a look at our review of the Best Standing Desk Converters of 2019. There are a number of different factors to address when trying to buy the best standing desk, and given everybody’s different wants and needs, we’ll try to address all the considerations one must make before buying your new office equipment. If you’re only just getting started in the world of stand up working, then you’ll be surprised to know that there’s more to it than just having a taller desk. In fact, there are three main types of standing desk, and choosing the right one for you depends mostly on your personal preference. This one is a good place to start and seems relatively self-explanatory. There are two main forms of standing desks, those that can be adjusted, and those that can’t. We address this issue first because it seems to be the most important. If you can be certain that you will be the only person using the standing desk, and that the desk itself will be ergonomically correct for you, then, by all means, opt for a fixed height standing desk. However, we believe this is most likely not the case. When choosing your standing desk we, therefore, recommend looking at desks that have adjustable heights. 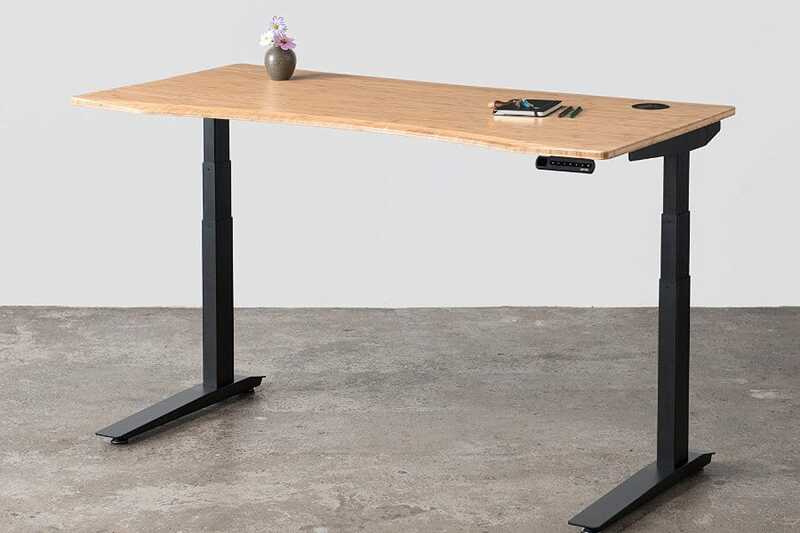 You’re more than likely going to share the desk with someone, and if not an adjustable standing desk gives you the flexibility to sit, stand, adjust for comfort and get the most optimal ergonomic position possible. The Jarvis electric height adjustable standing desk is rated among many as the best desk in the business! The sit to stand desk is probably what most people imagine when they think of a standing desk. Sit to stand desks come in a range of options, from your more basic manual adjusting height desk to an automated standing desk with smart memory technology. You might wonder why anyone would need such technology for just wanting to stand while working, but in fact there are many times where it is worth it: for example in shared office spaces where more than one person uses the desk. Take a look at our article where we discuss the pros and cons of manual and electric standing desks, and which one would be right for your situation. Standing desk converters allow you to transform your current desk into an adjustable height desk. A standing desk converter is a fantastic intermediary for people who want to dip their toes and get their first taste of stand up work. A converter is a smaller unit built to be placed on top of a regular desk. As we mentioned above, converters can also come in a variety of options, including adjustable or fixed height, and a wide price range. If you believe that this type of desk is right for you, then we have some additional reading for you! Here are our favorite desk converters of 2019, compared and contrasted so you can easily find one that is right for your needs. The beauty of a mounted desk converter is like other desk converters, it can be used with any old desk that you already have. A mounted desk converter clamps onto the back of your desk and has clamps where you are able to connect monitors, keyboard trays, and laptop trays. A benefit of the mounted desk converter is not only is customizability, but also its portability. Our of all the different styles of standing desk, we believe this is the most portable and transportable, so you can easily move it from desk to desk without too much issue. LifeSpan Fitness is one of the top brands for under desk treadmills. 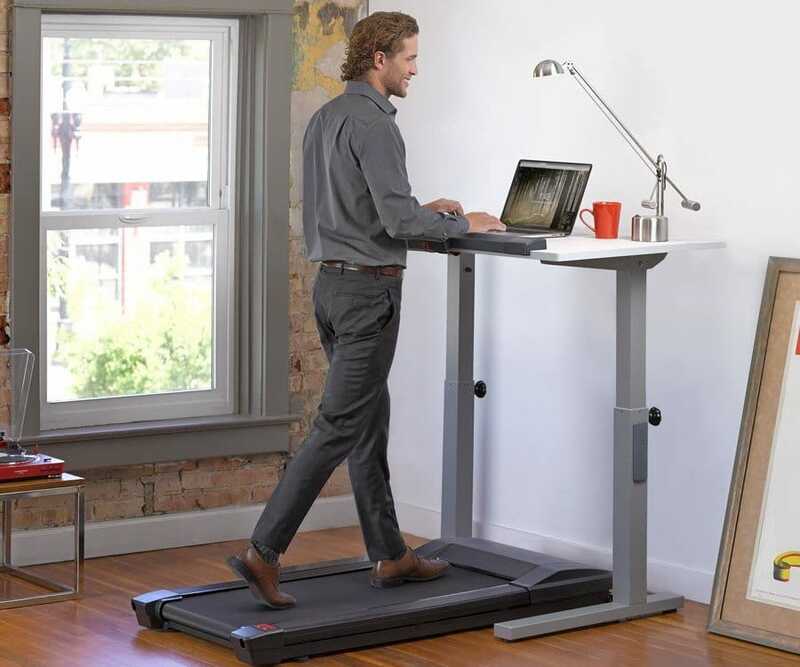 The real step forward into a healthy work environment, home office, or shared workspace: the treadmill desk. Now the treadmill desk is essentially a regular standing desk with a special small treadmill placed beneath. This is great for people looking to burn a few extra calories at work, keep fit and active, and really trying to end the sedentary lifestyle. The major downside of treadmill desks is the price, with most being around $1000, however, as often people say: when it comes to health and well-being there should be no price tag! LifeSpan fitness has a number of fitness options available, as does Rebel fitness and many other brands. If you’re looking for a treadmill desk, then we think that you might want to take a look at the top rated treadmill desks, which would be suitable for almost any standing desk setup. Correct ergonomics in the office requires very specific adjustments for different reasons, and a standing desk with a large range is very useful. Among the adjustments, is whether the standing desk has a separately adjustable keyboard and monitor, or if it is all on the same plane because oftentimes to be in the correct position you must keep the keyboard lower than the screen height. If you solely work using a laptop, we highly recommend buying a separate keyboard, or a separate monitor, so you can have both your eyes and hands in the most optimal positions. In this section, we can basically skip all fixed height desks (another reason why they aren’t truly worth considering) and only look at the adjustable converters and desks. Essentially, there are two main types: straight bench (i.e. single platform) or multiple platforms. Our recommendation is to always err in favor of the stand up desks or converters with the most available adjustments, because, although you may be the same height as someone else, you could have longer arms, different posture, or other preferences that you’ll want to be able to adjust. Remember, when typing, your monitor needs to be around eye level, and your hands should be relaxed around waist height, to avoid putting unwanted stress on the neck, back, and wrists. HANDY TIP: For even better ergonomics with a standing desk, an adjustable monitor arm will help you greatly. Now, before you even think of purchasing your setup, you should determine exactly what it will be used for. 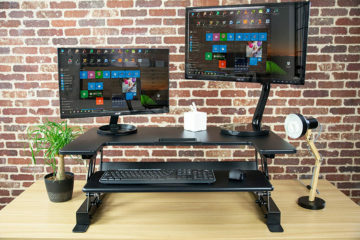 Are you someone who just needs to use an elevated laptop stand, or will you have 2 extra monitors and a large desktop computer? 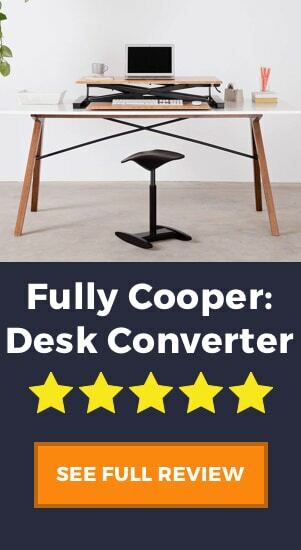 Once again, the higher-end stand up desks and converters will be able to hold a significant amount of weight, probably much more than you would ever have on your desk, but if you are looking at a low cost stand up desk, then it will pay to take its weight capacity into consideration. Additionally, the weight capacity is also correlated to the size of the desk. Size is important for two reasons, how much you can fit on the desk, and if the desk is transportable. Large sit to stand desks can be reasonably heavy and usually (but not always) a fixed location desk in an office, or even in your home office. Maybe you might be looking for a sit-stand converter that you can pack in the car and take home after a day at the office. We know most people don’t like to bring their work home with them, but if you have to, try to make it comfortable! So in this case, have a look at the mountable converters or sit stand converters like we mentioned before. Lastly, if you are a tall person and need a few extra inches added to you desk, we recommend you have a look at our list of the best standing desks for tall people. This video demonstrates the capabilities of a great motorized standing desk. This is where the desks begin to get a bit more expensive, but it could be exactly what you need. 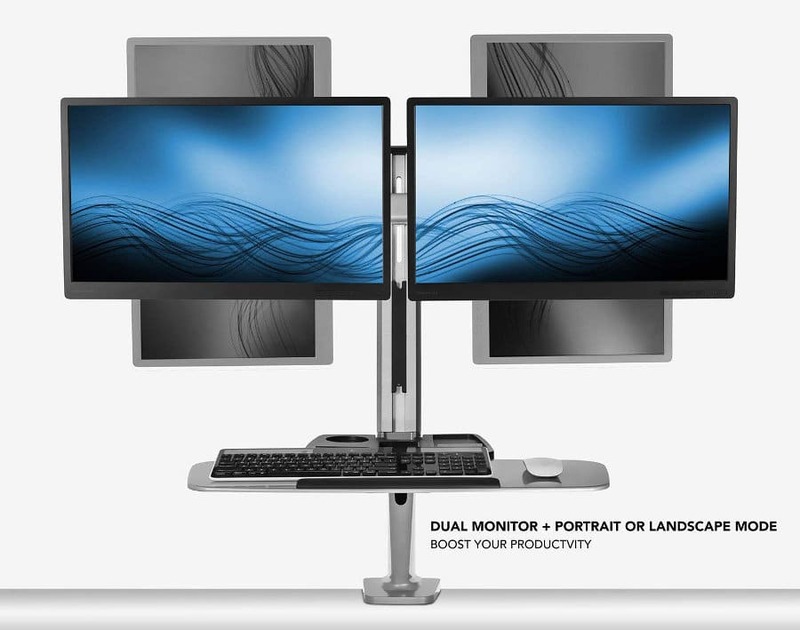 Imagine have a desk with large monitors and expensive computer equipment on it, which may be pretty difficult to lift up and down manually. Not only could it be too heavy and you risk injuring yourself, but also you could easily tilt the desk, make things fall, and break your equipment. The solution: motorized lifting desks. Higher-end sit to standing desks will have motorized legs to lift the table up and down with ease, and generally much faster than you can wind a crank. Again, like many features, automation is not an absolute necessity but if you know that you will be moving the desk a lot and adjusting the height, then spending a bit extra now will save your cranking arm in the future! As it should be, we like to save the best for last! Also, we believe that it is best practice when deciding on any product to remove the cost from the equation and decide what you really believe you need and don’t. 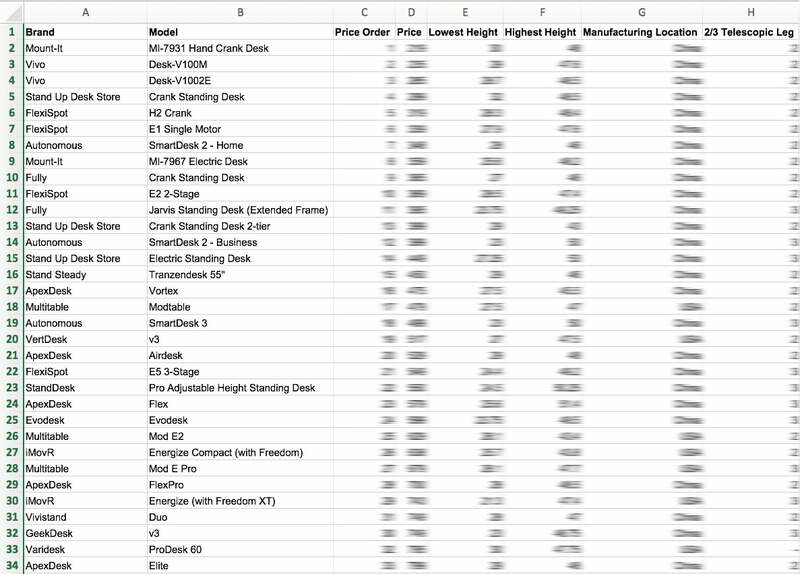 That being said, the range of price of stand up desks is so great, from around $25 to over $700, that it would be impossible not to mention this factor. So, are the expensive tables really worth it? Tentative answer: it depends. If the only goal is to be standing up at a desk, then absolutely go for the cheaper option. You can get away with even the classic DIY option of stacking your computer on boxes and books to get it to the right height, but if what you really want is comfort and longevity then its worth spending a little more. If the desk is for a shared working environment, then the high-end standing desks are highly recommendable, due to the aforementioned “smart” technology. It would be super frustrating to constantly have to change the desk settings back and forward and never quite getting it how you like it. If you are a student or just any person on a budget, then have a look at some more basic and affordable desks available to you. There is a range of prices here, starting from around $50 to desks under $200, and also a range of capabilities and options. As you see in this standing desk buyer’s guide there is no real clear winner to be drawn from any of the above styles, and this should merely be used to cut through the large amount of information that is out there. There are many types of standing desk, and although we mention only a few of our preferred products above, doesn’t mean to say that the others aren’t also as good. Our goal is to inform and educate, and hopefully, now you feel a little wiser and ready to take the plunge and buy your first standing desk. In the end, it will always come down to personal preference, budget, and need. Once you get standing up in the office, even for a few hours here and there, you will truly notice the benefits: higher productivity, fewer aches, and pains, alleviated hip, back and neck soreness, and hopefully even a bit of weight loss. So why wait? Don’t hesitate and get standing now! Hi Paul! Thanks for your message. We were happy to include one of your products in the above guide. Feel free to keep in touch and let us know about new updates from your company. Thanks!